We only charge the commission or service fee. 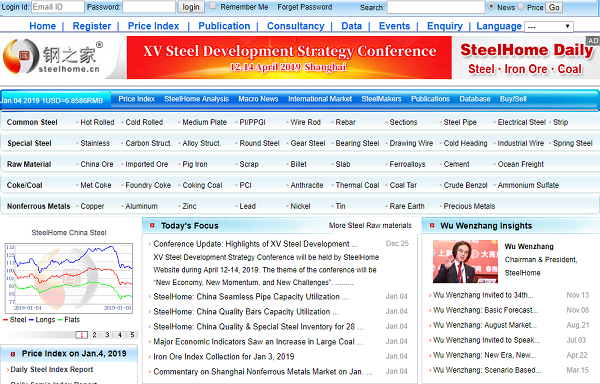 SteelHome website (Chinese: http://www.steelhome.cn English: http://www.steelhome.cn/en) provides real-time price, news and market analysis on steel and related industry. You can also find price index, price curve on SteelHome website. Products includes: Steel, Special Steel & Stainless Steel, Coke & Coal, Iron Ore, Base Metals and so on. SteelHome will help you collect the information according to your requirement. 2. Update Time: Daily/Weekly/Monthly, it all depends. Please contact SteelHome at tina.tong@steelhome.cn or on 86-21-50585733 for more details. 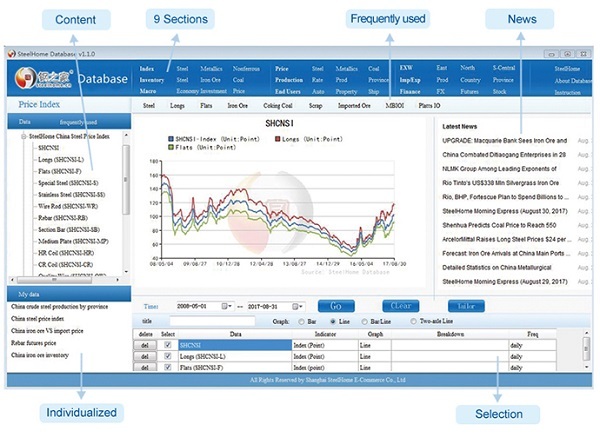 SteelHome Database mainly covers 9 sections, including Price Index, Market Price, Ex-works Price, Market Inventory, Production & Consumption, Import & Export, Macro Data, Steel-consuming Sectors, Financial Figures. The system is designed to be user-friendly so users can refer to max three trans-section data at the same time, put different timing period on each one of those, and make graph in types as they wish. 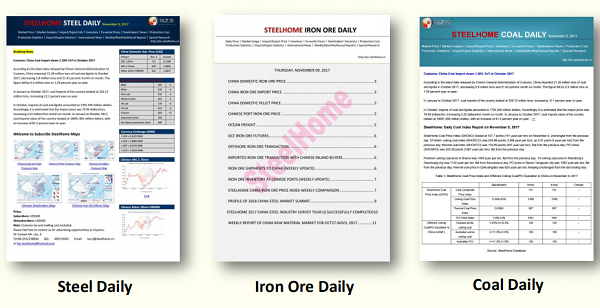 SteelHome provides Steel Daily, Iron Ore Daily and Coal Daily, which cover intraday prices, news etc. See an example here. The book is made up of an introduction of 160 steel mills and 100 steel traders in China. Business scopes, addresses and contact information will be presented in detail. The book will be offered as one of the benefits if you attend XV Steel Development Strategy Conference. 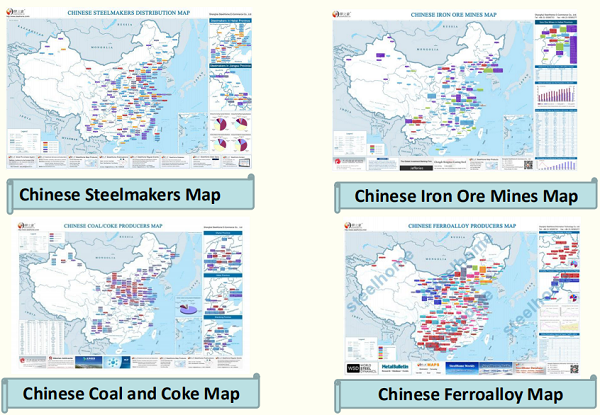 SteelHome provides steelmakers, iron ore mines, coal and coke producers, pellet mines and ferroalloy producers map. The map shows the location, capacity breakdown etc. See an example here. 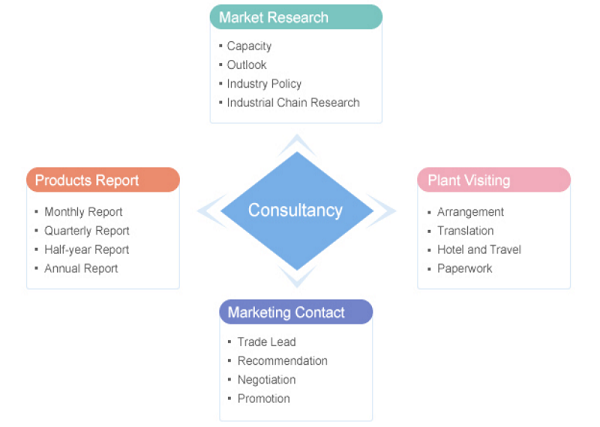 SteelHome provides professional in-depth market research and consulting services to global steel related industries, connecting world-wide steel trading. In order to better understand Chinaâ€™s steel market, SteelHome website will organize the survey tour regularly. Please contact SteelHome at tina.tong@steelhome.cn or on 86-21-50585733 if you have any interest. SteelHome provides service for market research on capacity, outlook, industry policy, industrial chain research. Welcome to contact Steelhome at tina.tong@steelhome.cn to customize reports. SteelHome, established in 2004, is a leading steel industry consultancy in China. It has attracted over 250,000 registrators from global steel mills, distributing circle, research institutes, raw materials suppliers etc. Should you have any advertisement needs, please be free to contact us for enquiries. 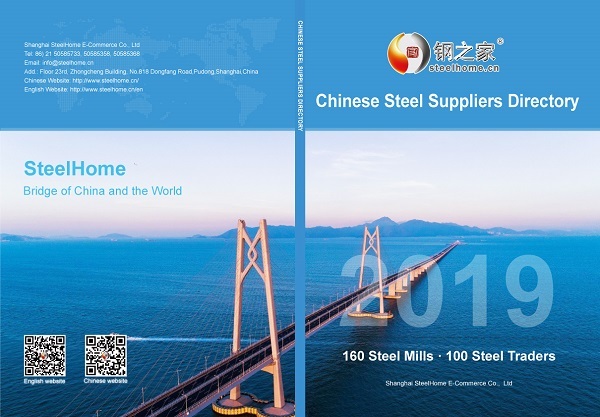 Against our years' connection with Chinese steel mills, miners and traders, we provide buy & sell agent service for offshore clients in purchasing steel products from China or selling iron ore, coal, scrap, pig iron and other steelmaking raw materials to the country. The conference hosts every April in Shanghai. The grand gathering attracts 800-1000 delegates each year with around 150 major steel mills and other delegates from trading houses, miners, industry associations, government officials, derivatives, research companies etc. With our widespread contact base within China, it turns out a great social networking opportunity for global businessmen. The conference hosts every October in major Chinese markets outside Shanghai, with around 600-800 delegates each year. SteelHome holds regional seminars almost every month in big Chinese cities, Shanghai, Beijing, Tianjin, Nanjing, Guangzhou, Foshan, Xiamen, Wuhan, Changsha, Lanzhou, Xiâ€™an etc. The half-day seminar is designed to provide closer interaction with regional market participants. The round table brainstorming exclusive for SteelHome VIP Subscribers. Compared with conferences, forums, seminars, it is more causal, which encourages free expression on market and help spark new ideas.